Hello, I received the free Commander Kappa for being a Twitch Prime member yesterday. However, when I use the 10 pt commander he does not generate any Elite Commander XP. 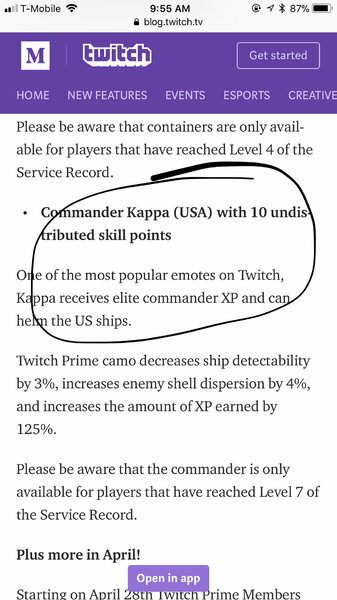 It was stated in your post that it will; it states, "...Kappa receives elite commander XP and can helm the US ships." I am part of a WOWS Clan and none of those members, using Commander Kappa, have that commander generating Elite Commander XP either. I have attached a copy of your Twitch announcement with the information you posted about Commander Kappa. Once he hits 19 points he will generate elite commander xp just like every other commander. That is no different than any other Commander out there. Doesn't make sense why they would advertise this commander to generate Elite Cmd XP if it is no different than any other commander. 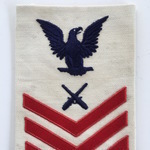 When they advertised it the way they did it made it seem the commander generates elite cmd xp right away. Why advertise something that is totally evident. Would be nice for WG to clarify their vague and not totally obvious statement then made in the article that I attached to this post. I suspect he can receive Elite XP but not generate Elite XP. I feel like "spend 4 minutes to sign up for something free" should have been a big clue that it's an amazing free thing and not the stupidest free thing ever given away on WoWs. So what is the difference between "receive" and "generate". I figured in the context of the statement, receive & generate would mean the same thing. If there is a difference between the two words in the context of the statement please explain how they are different. I only know of one way in WOWS elite commander xp is received/generated. You can give him elite commander xp to level him up, hence receiving it. Yes, ad seems misleading, but its free useful stuff, so I don't think its worth complaining. Thanks for posting this. I just signed up and look forward to opening my loot tonight. Only 19 point captains can make elite commander XP, level him up to 19 points first. Yes this I know. Wasn't the point of my post though.